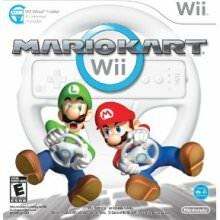 Home > Nintendo Co., Ltd.
Found 17 file extension associations related to Mario Kart Wii and 15 file formats developed specifically for use with Mario Kart Wii. The original kart racer is back on track with a motion-controlled edition for Wii. The 2008 release features classic characters, courses, and cups from previous Mario Kart games, both on consoles and handhelds. New tracks and championships are available as well, along with a new vehicle type. For the first time in the series, characters can race motorbikes as well as go-karts. Bikes can perform wheelies, and mid-air tricks add a speed boost upon landing. Many of the series' other classic power-ups return to the circuit in abundance, with plenty of koopa shells, bobombs, and invincibility stars. Several control schemes are available, making use of the Wii Remote (with or without the included snap-on steering wheel handle), the classic GCN controller or Wavebird, or the Wii's Classic Controller add-on. Following the lead of the DS version of the game, Mario Kart for Wii supports online multiplayer competition, for as many as 12 players in various modes. If you need more information please contact the developers of Mario Kart Wii (Nintendo Co., Ltd.), or check out their product website.